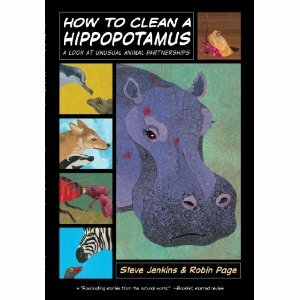 My kids had so much fun reading this book by partners Steve Jenkins and Robin Page. Jenkins is always a hit in our household, and his Beetle Book is consulted with regularly. The authors have so much respect for the animals they feature, and that comes across vividly. Collage illustrations make these animals come alive. This unique look at animal symbiosis gives a large lesson about nature not existing in a vacuum. There are so many new facts for the adult reader as well as for kids, as we are introduced to animals and ecosystems around the world. I think my kids liked the plover walking right into a crocodile's mouth best. They were a little grossed out by ants eating nymph excretions though! This comic book-like nonfiction is very appealing to kids who love animals. What kid doesn't? This post is for Nonfiction Monday, hosted this week at A Mom's Spare Time.